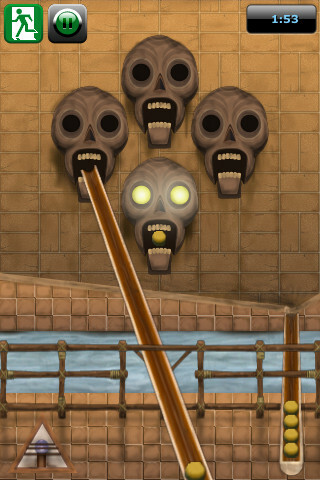 How do you choose a game from the baffling variety on offer on the App Store? When it’s only 69p at stake, the name is as good a reason as any to splash the pennies. Let’s Eat Sweets! – that’s Temporal Games’ exclamation mark, but I like it – definitely falls into the ‘good name, what the hell’ category. After all, who can resist sweets? I know I can’t, and that’s why I run. The little girl in Let’s Eat Sweets! also combines running and sweets, but the former in order to obtain the latter, rather than in mitigation for it. Not only can she run along any side of the screen, but she can also fall from any side to any other, in a slightly undefined floaty way. 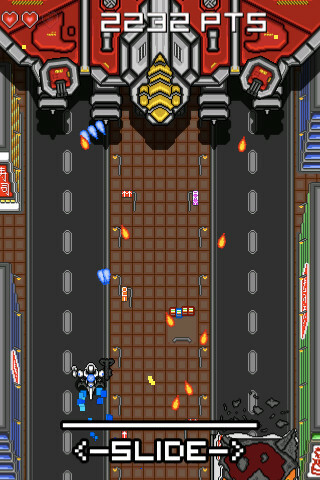 The tilt controls are good though, and with a bit of practise you can glide around the screen in wide arcs. It’s just not abundantly clear why you can. But the point of doing so is, naturally, to eat sweets. Equally important are the bonuses – extra time, speed-ups – and avoiding the opposing anti-bonuses. One bonus turns all the sweets on the screen into chocolate-covered sweets, because chocolate is best; an anti-bonus turns them all into bagels, because bagels are not sweets. 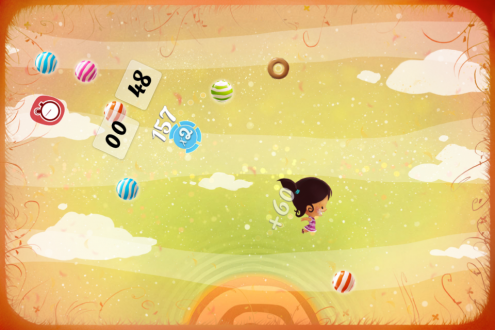 It feels slightly unbalanced at the moment, in that the appearance of sweets and bonuses – and thus the chance of a good points haul – is a bit on the erratic side, and the floaty mid-air control isn’t exactly intuitive. Yet the unusual physics are part of what makes it curiously likeable. 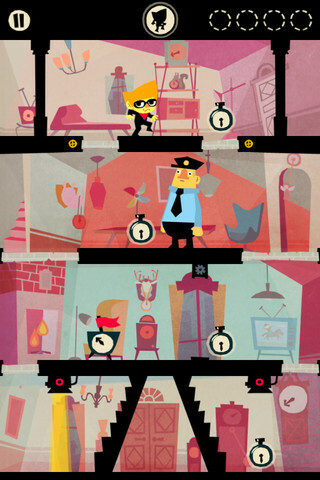 That and the look of the game, which is cute while managing to remain distinctive – no mean feat on the App Store. 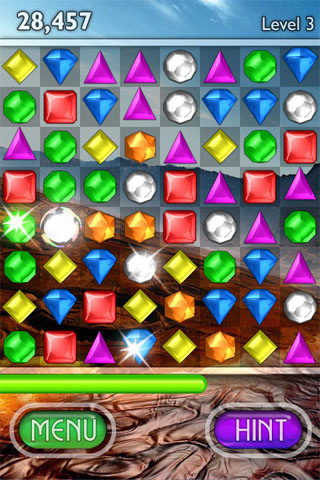 Warning: mobile games can cause severe earworms. This week I’ve been warming to Whale Trail – which Adam covered last week – and with that the Gruff Rhys track of the same name has become firmly stuck in my head. The lyric, “I can see my house from here,” in particular, in a very bad approximation of a Welsh accent. It’s been that or The Crystal Maze theme tune. Or, bafflingly, ‘Baby Come on Over’ by Samantha Mumba. Enough. We begin this week with a Multi-Writer Bonus Round! – as Adam tackles Wonton 51. A game named after a Chinese dumpling, featuring bowls of Japanese ramen, and sushi signs. The mix-up is probably intentional, as the game tries to cram in anime cliches, lolspeak and “endless bullet dodge panic!” gameplay, somewhat like Ikaruga as designed by anime fans. 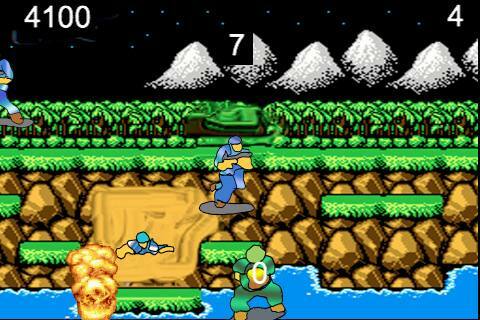 Retro-style shooters are generally well suited to the iPhone. In Wonton 51 you juggle between shooting and dodging waves of bullets, which can make for an intense and tricky experience, but sometimes gets hampered by the limited controls. You need one index finger to slide your character left and right, and another to aim shots. 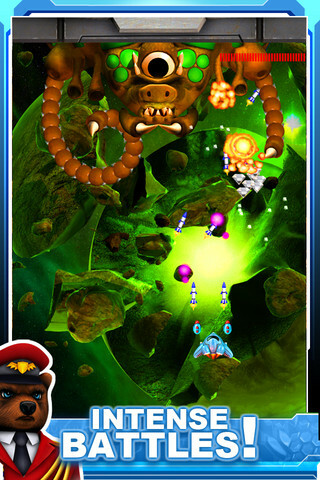 It’s a mechanic that would make use of dual thumbsticks on a console, so the iPhone’s touchscreen is a slight hindrance. Wonton 51 feels like a game with good intentions. The artwork has a certain charm and the sound effects have a nice 8-bit NES-style vibe (plus random Japanese girl speech samples). If you keep at it there’s enough of a challenge, though it doesn’t really manage to ramp things up or go far enough, which you kind of wish it would. Having never owned a Nokia phone, the Snake phenomenon passed me by completely; frankly, it didn’t feel like I was missing much. But I am thoroughly ashamed that I let Hard Lines pass me by when it was released in the summer: it’s outrageously good. 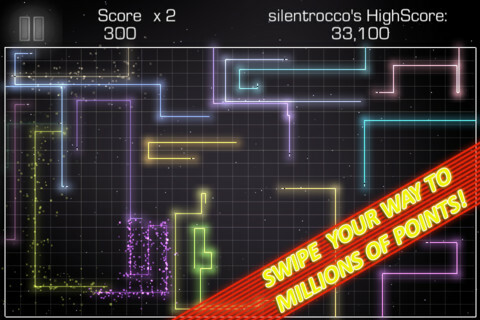 There are plentiful modes, but all basically boil down to moving your line around the screen, collecting glowy things, forcing other lines to run into you, and trying not to run into your own tail. It’s perfectly entertaining score chasing stuff, but elevated to sheer brilliance by a staggeringly well-judged dose of humour. The lines regularly spew short lines of text, with references from The Fast Show to Futurama, and doubtless many that I missed. It doesn’t become an unwelcome distraction, precisely because it’s not distracting if you’re trying to concentrate on not dying – which, in the wisely named Gauntlet mode, is frequently all you can do. Wonderful stuff. I enjoy a good boss battle; though I hate a generic boss battle at the end of a long level. A game focusing on boss battles, then, sounds like a good idea: all of the developer’s energies going into imaginative boss design, and no slogging to get to them. It’s remarkable, then, that the bosses in Boss Battles are so uninspiring. They’re interesting enough cosmetically, but there’s no thinking required, just constant shooting. Which is pretty inexcusable. On the plus side: it’s free, with the option of in-app purchases to buy upgrades and avoid a bit of grinding. It’s still not worth it though. Since Challenge became available on Freeview, I’ve watched a fair bit of The Crystal Maze, and it’s still brilliant. The Richard O’Brien era, anyway; Ed Tudor-Pole does not compare. Fortunately it’s O’Brien who features in the game. Unfortunately, he doesn’t feature very much. There’s a soundboard, but that aside speech samples are few and far between, and you have to make do with text. It’s not as evocative as it could have been, then, though the moving-to-a-new-zone sequence has made it wonderfully intact. The games themselves are generally quite simple. Towers of Hannoi, anyone? Slide puzzle? Not desperately original, but serviceable fare – and reasonably representative of the TV show. It just turns out it’s more fun to watch than play. Which is a shame, because the developers seem so enthusiastic and eager to please. A lot of people seem to have taken umbrage at Katamari Amore’s pricing structure. 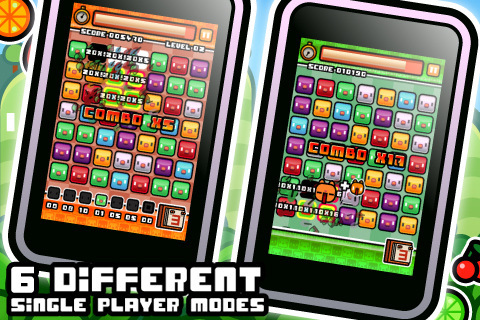 It’s a free download, which gives you access to one level in time attack mode. Essentially, it’s a demo. What’s wrong with that? Honestly, people have been spoiled by the level of freeness on the App Store. What this one level lets you do is discover that, as you probably suspected, Katamari doesn’t really work on a touch screen. 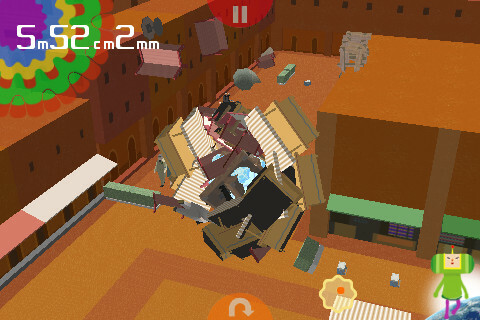 Tilt controls are hideously unresponsive, and virtual stick(s) lack the weight of control you need to manhandle a Katamari around. It’s also prone to a smidgen of slowdown. But if, like me, you choose to throw some pence Namco Bandai’s way to get some more levels, you might not be crushingly disappointed. Incidentally, I eventually settled on the single virtual stick controls, unfortunately finding twin sticks a bit fiddly on a touch screen. 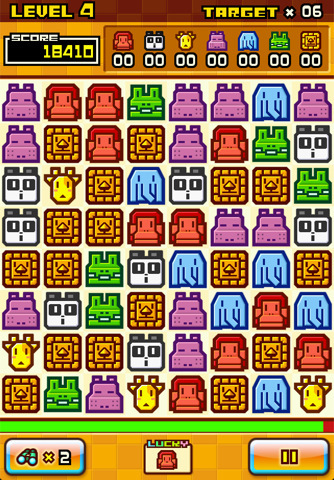 There is still fun to be in the basic task of rolling up the occasionally curious assortment of objects you find, and the satisfaction in the shift of scale is undimmed: from rolling up scraps off the floor in one tiny area at the start of the level, to consuming the entire environment with your building-dwarfing Katamari. What is slightly dimmed is the game’s personality. It’s telling that I was soon skipping virtually all of the dialogue – once a selling point of the series. Maybe it’s the law of diminishing returns, but it just didn’t grab me. The levels are all new to this game, and unfortunately they’re not great. I’m talking to you, Space Center – a sprawling yet sparse level, which is staggeringly unsuited to the small screen and slightly fiddly controls of the iPhone. It really is a thing of horror. 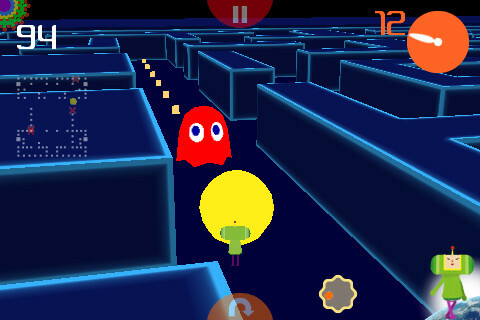 The Pac-Man mini-game is similarly unsuccessful: rolling Pac-Man around is a nice idea, but surely someone might have noticed that the walls of the maze rather get in the way of your view. Not a disaster, then, but neither is it particularly worth playing. Just dig one of the PlayStation 2 titles: they’re loads better. Apple’s App Review Board has come into scrutiny after letting an unofficial Teenage Mutant Ninja Turtles game slip onto the App Store. The game, which is apparently close to being unplayable, has been created by a Vietnamese developer going by the name of either Dang Van Phuong or Namphuong Star – depending on which news source you trust. A quick look on the App Store shows that it has now been removed so we’re unable to research their name for ourselves. Develop-Online reports that it went up on the App Store six weeks ago (18th August), so it’s not hard to believe that a fair few people were duped into buying it for the $5 asking price. According to Destructoid it was still available to download earlier today. Nickelodeon currently owns the Ninja Turtles license, and it’s not just Nickelodeon that are victims of copyright fraud here – the backdrops have been lifted from Konami’s Contra. Imagine if Nintendo ever let something as dodgy as this slip onto the 3DS eStore. That would certainly turn a few heads.